“Playing the Changes: Performing Flexible Identifications.”American Folklore Society’s Annual Conference, October 2013. “The Politics of Participation: Dilemmas in Cultural Consumption among the Surinamese Maroons.” SEM/AMS/SMT Conference, November 2012. “Creole Languages in Scholarship: Challenges, Politics, Myths.” African Languages in the Disciplines Conference, Harvard University. April, 2012. “Personalizing Tradition in Surinamese Maroon Folkloric Dance.” African Dance Diaspora: A Symposium on Embodied Knowledge. Harvard University, March 2011. Society for Ethnomusicology National Meeting, November 2010. Harvard University Graduate Music Forum Conference, March 2010. Corinna Campbell’s work focuses on music and dance in the African Diaspora and West Africa, with a specialization in the traditional genres of the Suriname Maroons. Both her recent research in Suriname and previous work in Ghana have been propelled by her interest in three overlapping themes: performance-educational strategies in bridging cultural divides, music/dance interconnections, and the uses of music, dance, and related social discourses in navigating broader systems of power. Her first manuscript, tentatively titled “Personalizing Tradition: Practicing Community and Articulating Selfhood through Surinamese Maroon Music and Dance,” examines how culture-based collectives mobilize tradition in order to fulfill a variety of social needs and aspirations. While this concept is broadly applicable, it carries particular implications for Maroons (a minority population descended from escaped slaves) in their ongoing struggles for rights and resources in Suriname, a young and ethnically diverse South American country. Professor Campbell is the director and founder of the Fieldwork Mentoring Program, co-sponsored by the Society for Ethnomusicology’s Section for the Status of Women, and the Gender and Sexualities Taskforce. 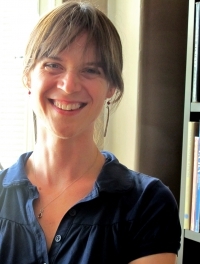 Her research has been funded by a number of institutions, among them the Fulbright Program, Harvard University’s David Rockefeller Center for Latin American Studies, and the Andrew W. Mellon Foundation. Prior to joining the faculty at Williams, Professor Campbell taught at a number of Boston area institutions, including the Massachusetts Institute of Technology, Boston College, and Harvard University.